For years, cybercriminals have been experimenting with new ways to steal and extort money from their victims. In the last few years, the biggest trend is cryptocurrency. Join our informative webinar to learn more about how it works, and how you can keep your business safe. Small and medium-sized businesses are major targets for cybercriminals. To stay safe, today’s businesses must understand the different types of cyberattacks they may encounter and implement strong cybersecurity practices. Register for this 30-minute webinar on the key threats businesses faced in 2019 and what's upcoming in 2020 to get details and tips that will help you keep your business and clients safe. Our Threat expert will be discussing ransomware, banking Trojans, phishing and all the crypto-crime that’s wreaking havoc on IT pros. The role of the cloud within security can be confusing and scare many customers away. Learn 5 tips to help implement cloud-based security with clients. Discuss how to balance an approach with customers with those tips and understand the important questions to consider with customers considering cloud security as an option. One thing is certain: the threats and attacks small to medium sized businesses are facing keep changing. This webinar looks at the threats Webroot, our MSP Partners and SMB Clients are experiencing and their impact to their business. The aim of this webinar is to give you threat information that you can easily share with your business colleagues or managed services Clients, and reassure them you have the knowledge and the tools to look after their business and endpoints. There are tried and true best practices established for building profitable managed IT service businesses. This session shares those best practices and provides in-depth advice on 6 key actions to achieve that goal. From understanding the opportunity to developing a marketing plan to supporting the sales team, attendees will gain valuable insight into how their business can operate. IT Security for small to medium sized business has literally turned from being a situation where your Clients’ were complacent about IT Security to it now being a critical, highly demanded service offering. This presentation looks at what has driven this tectonic shift in Client attitudes, and how IT Security needs to rapidly evolve to let MSPs have access to the expertise and security technology they need. Many MSPs are struggling with how they should approach this new paradigm. This presentation aims to help you look at some of the options open to you. Small businesses are commonly described as the lifeblood of the global economy. This is not hyperbole as SMBs account for the vast majority of business entities, while serving as a key driver of job growth and innovation. Success as a small business owner means overcoming challenges on many fronts, but also embracing new opportunities in technology and business. CompTIA’s latest research explores the business relevance of technology to SMBs and the factors affecting their perceptions, decisions, and investments in established and emerging technologies. We also explore the professional services industry, taking a look at their decision to offer technology to their own customers. As technology becomes a critical component for digital organisations, security becomes an even higher priority. Most companies know that security is important, but they aren’t sure which steps to take as they change their IT approach. This market intelligence session, based on CompTIA’s latest research, describes the areas that every business should focus on: the new technology that is needed, the new processes that must be adopted, and the education that must be given to end users. Phishing is literally flying under most organisations radar, but when you look at it over 9 out of 10 successful security breaches start with a phish. Phishing is not one thing but many things and its constantly adapting and morphing to make itself harder to detect and so harder to stop. We used to talk about polymorphic malware, but we are now in the age of polymorphic phishing. This webinar looks at the real threats that phishing poses and the defenses you can use to mitigate its effects on the profitability of your business. The year 2018 saw a significant number of major events showcasing cybercriminal innovation. We saw cryptojacking and botnets grow to their largest levels, ransomware become more targeted, and phishing transition from financial to tech targets. Webroot believes it's possible to effectively protect businesses and clients, but only by understanding your adversary and the techniques they use. In this webinar, Webroot Sr. Threat Research Analyst, Tyler Moffitt, will offer insights into the prevailing malware trends and tactics of the last year, and discuss how implementing a layered security strategy can help you protect your clients in the year ahead. We hope you can join us for this live, educational session! With cybercriminals constantly seeking innovative ways to steal information and monetise data, it is crucial for businesses and MSPs to keep up to date on emerging trends in the threat landscape. Webroot is hosting a series of webinars every 3 months that aim to keep the industry informed on the latest threat trends and review the top cyberattacks that hit businesses each quarter. These webinars will also provide tips on how to stay safe in a complex threat landscape. The past few years has seen a move towards targeted attacks. Attackers are no longer trying to infect the globe and are instead carefully selecting targets to maximise payouts. SMBs are right in the cross-hairs as their lack of defense and contingency plans can often leave them vulnerable to ransomware, information theft and other attacks. Is your organisation a soft target? Increasingly, automated processes can figure this out in a matter of minutes. Learn how to lift your organisation from the level of easy target and bolster your defenses against this scary current criminal focus. Cyber criminals are constantly targeting MSPs, but in 2019 this has become a worrying trend. Learn about the key targeted cyberattacks MSPs have been facing so far this year and how to protect your business against them. More than 88% of malware trying to enter your network can be stopped with a DNS filtering solution. These allow admins to take back control of their network, securing all devices, preventing internet misuse, and improving productivity. A filtered DNS solution is capable of blocking DDoS attacks, botnets, cache poisoning, and other threats. In this webinar, we’ll discuss the importance of network security and how Webroot® DNS Protection can benefit your business and protect against attacks. As the volume, sophistication and complexity of attacks on SMBs grows, current IT Security solutions need to become more pro-active, automated and effective. This presentation looks at how SMBs and MSPs can tackle these issues now and in the near future, and equip with the IT Security expertise and technology they need to defend their Clients and benefit from the this growth market. Join Webroot's Sr. Threat Research Analyst, Tyler Moffitt to learn about our threat discoveries and how to protect your business from emerging threats. More than 88% of malware trying to enter your network can be stopped with a DNS filtering solution. These allow admins to take back control of their network, securing all devices, preventing internet misuse, and improving productivity. A filtered DNS solution is capable of blocking DDoS attacks, botnets, cache poisoning, and other threats. 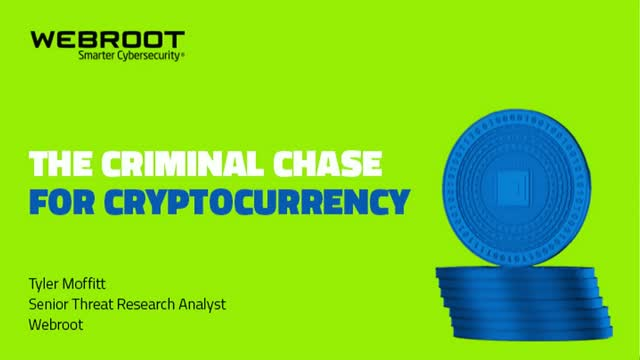 The Threat landscape has seen a rise of Cryptojacking, evolution of scams and malware such as Emotet and other cyber security issues such as Trickbot and Ransomware that have affected businesses in 2018. Join this 30-minute webinar where our APAC Threat Expert will walk you through Webroot's Threat predictions for 2019, so MSPs and SMBs can stay ahead of attacks and keep your clients and businesses safe. - Cryptojacking will keep rising while ransomware will decline . According to the latest Verizon Data Breach Investigations Report, human error was directly involved in 65%* of successful breaches in the last year, proving cybersecurity isn’t just a technology issue. People are the first line of defense against cyber threats, so educating them should be a major priority at your organization. Join our upcoming webinar to learn the risks associated with user error, 5 simple ways you can protect your business from phishing, and how security education can boost your bottom line. Webroot delivers next-generation endpoint security and threat intelligence services to protect businesses and individuals around the globe. Our smarter approach harnesses the power of cloud-based collective threat intelligence derived from millions of real-world devices to stop threats in real time and help secure the connected world. Our award-winning SecureAnywhere® endpoint solutions and BrightCloud® Threat Intelligence Services protect tens of millions of devices across businesses, home users, and the Internet of Things. Trusted and integrated by market-leading companies, including Cisco, F5 Networks, Aruba, Palo Alto Networks, A10 Networks, and more, Webroot is headquartered in Colorado and operates globally across North America, Europe, and Asia. Discover Smarter Cybersecurity™ solutions at www.webroot.com.